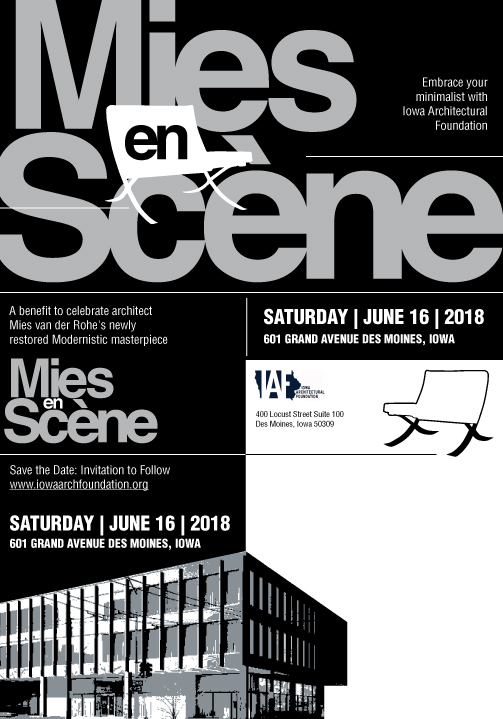 Join the Iowa Architectural Foundation for a special evening to celebrate architect Mies van der Rohe’s modernistic masterpiece, the historic Home Federal Savings and Loan Association building (built 1959-1962), now housing the Catholic Pastoral Center / Diocese of Des Moines, which recently completed a four-year restoration of the building. In his role on the building commission, College of Design senior associate dean Cameron Campbell helped determine the scope of the project, hire professionals to design and restore the building and strategize how to accomplish the complex restoration process. Enjoy building tours and hors d’oeurves, wine, craft beer and signature cocktails with catering by Trellis. Tickets are $100; proceeds benefit the Iowa Architectural Foundation. Contact Claudia Cackler, IAF executive director, (515) 244-1888, director@iowaarchfoundation.org, for more information.